Jonathan Oddi Named As Suspect Who Fired Shots In Lobby Of Trump National Doral Miami Golf Club : The Two-Way The man entered the lobby of the club and yelled something about President Trump as he opened fire, police say. Five officers returned fire and the suspect was taken into custody. Police respond to The Trump National Doral resort after reports of a shooting inside on Friday. 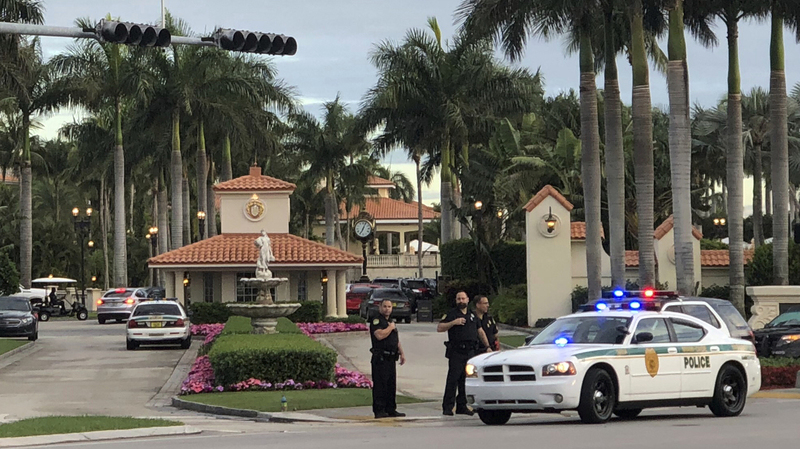 A man who fired shots in the lobby of the Trump National Doral Golf Club in South Florida and shouted statements against President Trump is in custody after he was wounded by police gunfire. Police say that after sneaking into the club through a rear entrance, the man, identified as Jonathon Oddi, 42, triggered a fire alarm. He apparently pointed a handgun at people at the hotel but did not shoot anyone. People who had been in the lobby were able to flee. "We don't know what his intentions were," said Miami-Dade Police Department Director Juan Perez. "It appears that he was trying to [lure] our police officers ... into this gunfight. He did succeed, and he did lose. That's the bottom line." Perez said that Oddi "came in, removed a [U.S.] flag from a flagpole at the rear of the complex and brought it into the hotel lobby and draped it over the counter, and began to yell out anti-President Trump rhetoric." "As he did that, he waited for our police officers," Perez said. "He did begin to shoot inside the lobby, which prompted calls and curiosity from some of the people in the lobby. They were met with an individual with a handgun who pointed it at them, and proceeded to fire into the roof and chandeliers of the hotel." After police arrived, Perez said, officers at the scene "did not hesitate for one second to engage this individual who was actively shooting in the lobby of the hotel." Five officers fired at Oddi during the gunfight, Perez said. The gunman sustained "multiple wounds to his legs" from gunshots, Perez said. One officer was hurt during the encounter, breaking his wrist in a fall, Perez said. The alleged gunman lives in Doral, Fla. Police are at his house now, waiting for a warrant to search the property and locking down the immediate area, Perez said.